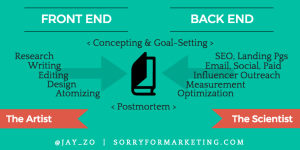 A few months ago we were intrigued by this post from Jay Acunzo on his Sorry for Marketing blog: Half-Baked Content Marketing Ideas: Front-End vs. Back-End Content Marketers. As content marketing matures, there is no “one size fits all” description of what a content marketer is. Jay Acunzo joined our #CMWorld Twitter chat to help both hiring managers and content marketers wade through the skills needed so managers can better hire the right people, and marketers can identify where there passions lie and build their ideal career. Want more from Jay? You can purchase our Content Marketing World video on demand where Jay presented two sessions: Create Ugly: Clever, Sneaky, and Downright Brilliant Ways Prolific Content Creators Make “Quality vs. Quantity” a Pointless Debate and The Content Wheel: Sustaining Momentum with Greater ROI While Punching Unicorns in the Face. #Cmworld A1: This is so subjective. Front end for us is marketing. Back end is all the technical peeps. I think? A2-1) I think it depends on the client base. If it’s a small firm, helping other small businesses, all inclusive is clearer. #cmworld cont. @CMIContent @Jay_zo Don’t be afraid to surprise us w/a response at 6:00 am tomorrow, if needed! The #CMWorld element of surprise! @CMIContent #CMWorld Per @Jay_zo’s diagram, it could mean top-of-funnel or customer-facing roles. Both could be right! If @jay_zo DID like “labels”….how would you characterize yourself (particularly as a marketer)? #cmworld I’m serious: what do you value? I guess @Jay_zo is not going to answer my question (at least not during #cmworld). Shame.